I earned Companion Pass status with Southwest which allows Kim to fly for free on any flight I book with points or cash. This will allow us to take (most likely) 2-3 more domestic trips with SW during 2013. The employees just might be the friendliest out there. From the ticket counter, to the flight attendants to the pilots- they all seem to have a smile on their face. Their unassigned seating seems a bit odd but it also seems to work. People line up by an assigned boarding group (A, B or C) and a number. You then line up at the column with your number on it and get to board accordingly. Due to traveling with an infant, Kim and I got to board right after Zone A. The boarding process seemed to move fast and there were no arguments or issues with people getting a seat. Overhead bin space never seemed to be a problem either- probably due to each passenger being allowed 2 free checked bags if needed. We found the seats to be very comfortable. This was a pleasant surprise as domestic flights usually seem to offer little space or comfort. The seats actually seemed to be roomier than on other domestic flights we’ve been on. A key factor was that when the person in front of you reclined, it didn’t seem to impede on your space much. The beverage and snack service is also done very efficiently. There were no carts blocking the aisles. The flight attendants first take all of the passengers orders on iPads pen & paper or a Cashless Cabin Handheld Device and then deliver the beverages. They even came around offering refills! The snack was nothing fancy- a small bag of peanuts and pretzels but it was better than nothing. Once the plane landed, it didn’t take long for us to get off the plane and to our surprise Lucas’ stroller was already at the gate, waiting for us! This is the first time we didn’t get stuck hanging around for the stroller. 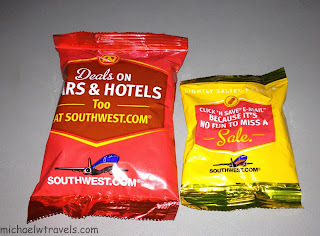 After flying with Southwest on four segments, I have to say that we are fans. I look forward to flying more with SW this year and hope that our flights will live up to the positive experience we had our first time around!